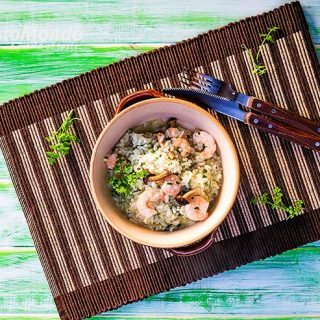 Green rice and prawns pilau recipe. Healthy and quick. Video included. Healthy eating doesn’t need to be complicated, hard or expensive. 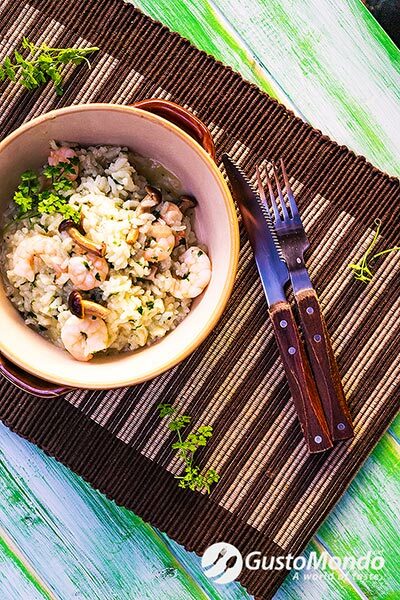 This prawns pilau recipe proves it. For just £2.30 per person, you can enjoy a flavoursome, light and healthy meal, in just about 30 minutes. Obviously you can make it even cheaper, by changing a few ingredients. Use frozen or smaller prawns, sunflower oil instead of olive oil, dried parsley instead of fresh. And leave the mushrooms out. But in my opinion, just over a couple of pounds per person isn’t that much. It’s the price of a cup of coffee out. See the short presentation video, and the list of ingredients, prices and how to make this dish follows below. Dice the onion. Thinly slice the garlic. Sweat for a few minutes in the oil until they soften and translucent but don’t let them change colour. Get the rice into the pan. I didn’t even bother to wash it, let alone soak it in water. As it is works just fine, the rice needs to be a touch sticky when cooked. Mix the rice in the pan for about 30 seconds to get it warm and coated with a touch of the oil. Pour in the stock. The stock is important, as it will be absorbed by the rice. Therefore, use whatever you have best. You could use a stock cube, vegetable or chicken, ready-made stock, or homemade. I usually make my own stock and freeze it in 500 ml water bottles. Then use it when I needed. And it doesn’t cost me almost anything at all to make. Season with salt and pepper to taste. Just make sure you taste it, the stock could be salty. The optional mushrooms can be added to the pan now, sliced or in pieces, depending on size. Cover and simmer on a low heat for about 20 minutes until the rice is cooked and the stock has been absorbed into the rice. Check the rice a couple of times to make sure that it has enough stock and doesn’t burn. Stiring it is fine. Finally add the prawns and the parsley, and let it cook for further 2-3 minutes, depending on the size of the seafood. Garnish with fresh parsley. Easiest way of cooking basmati rice. « Oven baked zander on a vegetable bed and crispy coating.